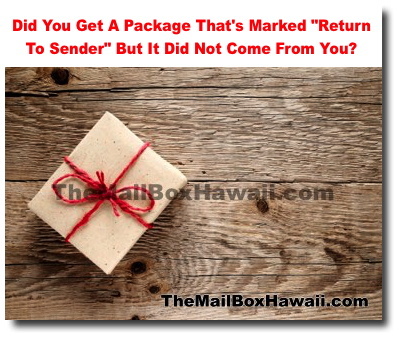 Did You Get A Package That's Marked "Return To Sender" But It Did Not Come From You? f you received a returned package with your address but DID NOT send it, you could be the victim of a credit card scam. Postal Inspectors suggest you check your account with your issuer or bank. If you believe you're a victim of Mail Fraud scams, please file a complaint with Postal Inspectors online or call Postal Inspectors at 1-877-876-2455 (option 4, Mail Fraud).